Buying a harp can be a big step. 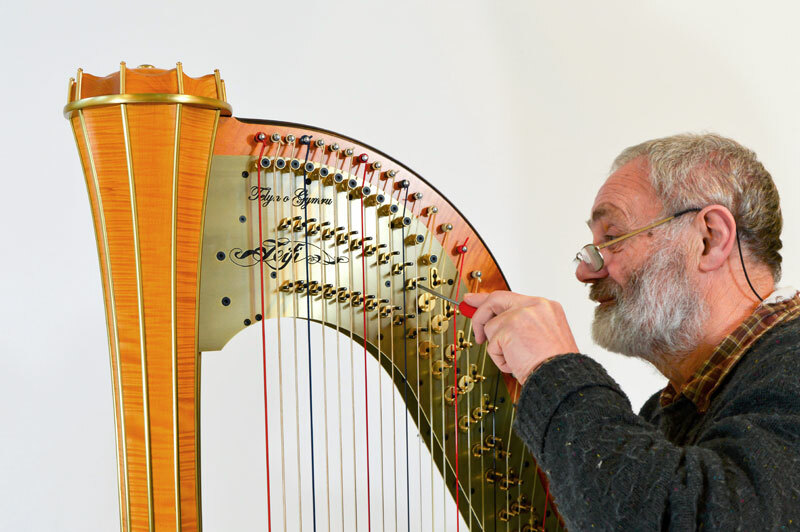 It’s important to know how to look after your harp so that you can get the best out of it and enjoy it for years to come. This guide will take you through some of the principles of harp care for both lever and concert harps. You can watch Allan explaining some of the basics with the video on the right, or read below. The harp is mostly made of natural materials – wood, gut and glue, so good harp care is essential. There can be as much as a tonne of tension on the harp’s strings, so any knocks or blows to the harp can have long-term effects. Every good harp mellows with age and you will find that the sound of your harp will change with time. You can help the sound to develop by keeping your harp in tune and playing it regularly. How should I store my harp? 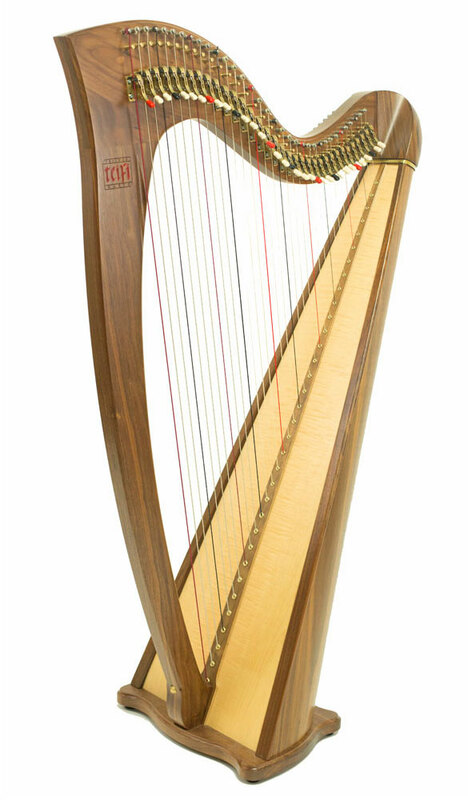 Natural materials are very susceptible to changes in environment, and fluctuations in humidity and temperature can affect the structure and performance of your harp. We take every care to season our wood but a centrally-heated home can cause wood to lose as much as 15 percent of its moisture. This can cause the wood to shrink, joints to open and cracks to occur. Keep your harp in a quiet spot (preferably a corner) away from household traffic, draughts and sources of heat such radiators and direct daylight. Help to maintain a healthy moisture level with radiator hangers or bowls of water (a moisture meter is a good investment). A good range of relative humidity for harps and other instruments is around 40-50%. How should I transport my harp? Ideally your harp should be transported using heavy duty covers to protect it against knocks and bashes. When packing a lever harp, try to ensure that all the levers are in the down position and that they are facing upwards/outwards with the tuning pins taking the load. The same applies to the orientation of the mechanism of a concert harp. When lifting a harp try to pick it up directly off the floor rather than dragging it along. Most harps are finished with a durable laquer that should protect it. Finger marks and dust can be removed with a soft lint-free cloth. Use a soft make-up brush to keep the semi-tone mechanism and soundboard free from dust. Areas which receive a lot of wear such as the top sides of the sound box can sometimes benefit from a light layer of wax so that the varnish last longer. We would also recommend that you avoid wearing jewellery such as rings and bracelets when playing the harp as this can often knock the harp and cause damage. Tempting though it may be, please do not use furniture polish on the soundboard! Always use the correct string – using the wrong string or wrong gauge will put undue tension on the harp, as well as sounding strange. A string chart should usually be included with your harp, but if you have any questions, contact us. Never leave your tuning key on the tuning pin – it’s an accident waiting to happen! Remember to have your harp serviced and regulated regularly – this will catch any potential problems early on and ensure you get the best performance from your instrument. A new harp will usually need servicing in the first year of its life (usually, this involves regulating the position of the levers to ensure that they retain their accuracy as the soundboard rises under the tension of the strings). Following this, the interval can vary depending on how much the harp is played, but as a guide around every 2-3 years is sufficient. What is a twisted neck? The neck is the curved part of the harp that runs from the top of the column to the top of the sound box. It’s where the tops of the strings are held and where any semitone devices (levers/hooks/blades, etc) sit. There is incredible tension in the harp due to the strings (nearly one tonne), so the neck and soundboard naturally want to meet to relieve this tension. It is the harp-maker’s challenge to make sure that this never happens. Because the strings are attached to the side of the neck (rather than through the centre of the neck as is the case in Paraguayan harps) it can begin to move over time. This can ruin the mechanism that runs through the neck of pedal harps, and eventually means that the semi-tone mechanism no longer makes contact with the strings. In the most extreme case, the neck will give up its unequal struggle and collapse into the harp. Early warning signs tend to appear in the middle of the neck (around middle F/G on a concert harp). Why is my harp buzzing? You should also check that it is in fact your harp which is buzzing – you may find that it’s something else in the room, such as a fan or loose light fitting! Why is my harp squeaking when I play it? Some hand moisturisers contain oily compounds which come off your hands and end up on the strings. When built up in excess amounts they can can act a lubricant and cause the string to squeak when your finger plucks the string. This can be easily remedied by cleaning the strings with turps or white spirit. I see lots of old harps for sale – are they worth buying? Be very cautious – if a harp hasn’t been strung or kept in tune for some time, the chances are that it won’t withstand restringing now. Always buy a harp from someone who can give you a good idea of the history, how it has been played, where it is kept, how it has been transported, who serviced it. Asking these questions can avoid costly mistakes.